We are kicking off 2018 with a Spectacular Sofa Sale: 30.18% off the first 10 custom sofas of the year. And our floor samples are on sale, too. Let's create your dreams of home: Comfort in Your Style. The last 2 years have been overflowing with projects in the physical world...interiors are, after all, analog in the best sort of way. After catching our breath, we are re-entering the digital realm with renewed energy, and look forward to seeing you here as well as in the shop or in your home. Here's to keeping up with all that is Spectacular & Beautiful! As the new year begins, we are mesmerized by the ethereal art of Laura Janes. Capturing the majestic dance of life, light and color, she dances through nature's endless, complex seduction, resulting in art that is always an affair of the heart. Our Sofa of the Month, January, grounds Laura's deep blue painting. In our showroom, January is dressed in white velvet made to withstand anything — not even red wine can conquer it. You can test the power of this velvet tomorrow night, and if indestructible white velvet doesn't take your breath away, you can choose from a myriad of fabrics and leathers to create the sofa of your dreams. Please join us & experience the Art of Living With Awe. Stop in for a treat, a sip, and a colorful evening. on NW 9th and Flanders. To commemorate this Spectacular happening, we're extending our hours on Friday and Saturday, bringing in live music, hosting industry experts, holding a kitchen design contest, AND giving away up to $1,000 of free upgrades (per household). Spectacular Design house contractor will be talking about remodeling — what to think about when considering a remodel, and what to do to prepare for a remodel that makes the process go smooth and easy. People will have the opportunity to discuss with contractor one-on-one. Spectacular Tile Expert, Amy Bright, will be talking about large format tile, which is on trend and super impactful. People will have the opportunity to discuss tile projects with her one-on-one. So come in, have a seat, stay awhile! And we love the transformation. 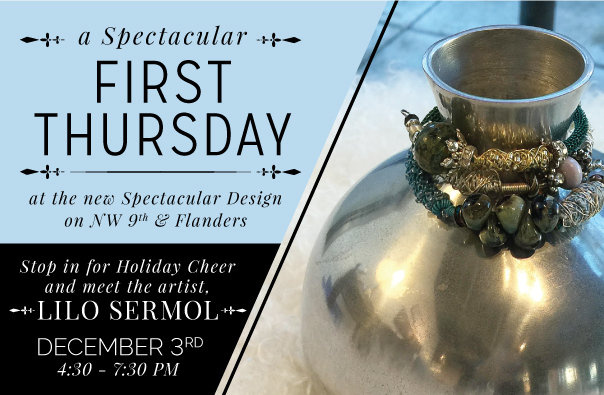 We are happy to announce that Spectacular Design has opened a furniture and home furnishings store in the heart of the Pearl's art gallery district! We invite you to stop in, take a seat, and stay awhile as you explore our curated pieces from across the industry that will transform any home into a haven. ...........to the February 1st unveiling. Stepping into the new year, may your 2015 be truly inspiring! Let Us Help Create & Fulfill Your Dreams of Home. We can help you create the spaces that look fantastic & feel Spectacular in this new year. On-site consultations are by appointment at your convenience. Call 503.929.4675 to begin creating your dreams of home. Or contact us here.